Singha Beer – Thai Beer for Thai food. We’ve asked people to submit their original Thai or Thai-inspired recipe for a chance to win two cash prizes of $599 and $399 from SheSimmers.com. And they did. Our three judges have reviewed the entries after the submission deadline on July 11th, 2011, and they have named the following entries as the finalists. Here are the finalists, listed in no particular order. Finalist #1 is Merry of My Merry Cooking who has submitted Spicy Ginger Chicken-Cakes on Hot Thai Dressed Cabbage. Our judge Bill Daley is impressed with this entry. “Sharp, attractive photos help tell the story; clear recipe instructions; conversation tone is helpful and encouraging. People love shaping foods into patties, burgers and cakes like this. I think people will make this recipe,” he says. 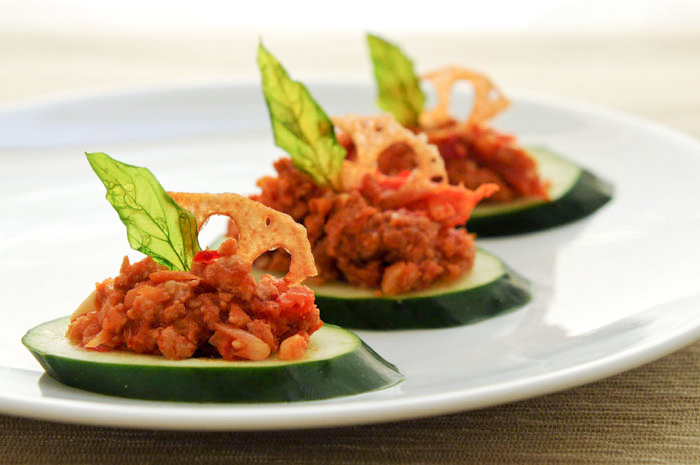 Finalist #2 is Rachel of Rachel Cooks Thai who has submitted Northern Thai Dip (Nam Prik Ong) Cucumber Appetizer. Finalist #3 is Sonia of My Little Kitchen Laboratory who has submitted Coconut Quinoa Cakes with Shiitake Peanut Red Curry Sauce. “I thought the recipe fascinating; the use of a hot ingredient like quinoa was a smart move to reach adventurous cooks,” says Daley. “Hot, rich, spice over neutral grain — delicious,” says Hammond of this entry which he considers a good looking dish and an easy-to-follow recipe. “This sounds like an excellent high taste/low fat recipe that’s definitely in the Thai tradition but that utilizes a key ingredient – quinoa — that is not in the Thai cannon,” he says, adding that the red curry sauce, coconut and garlic sound good with the grain and the peanut. Finalist #4 is Chris who has submitted Fried Wontons with Pork Filling which he serves with a dipping sauce — a blend of original Thai Sriracha (similar to this) and Thai chilli jam (Nam Prik Pao). Although Sula thinks cilantro stems should have been mentioned as a substitute for cilantro roots which are hard to find in the US, he likes this recipe. Simplicity is cited first as one of the reasons. The use of proper ingredients is also what impresses him about this entry. “[It’s] one a of few to use fish sauce,” he notices. Then there’s faithfulness to technique — pounding ingredients in a mortar. “I’m really into pounding lately,” he adds (evidence). 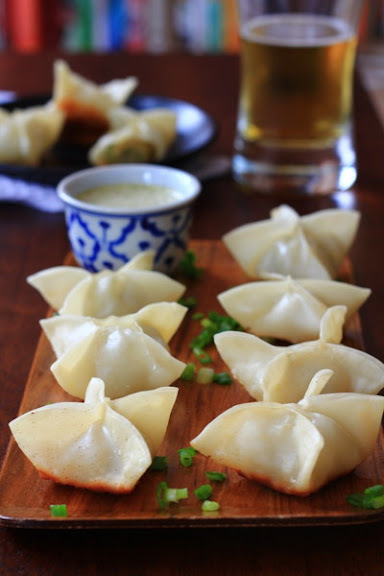 For Sula, connection to something everybody is familiar with, like wontons, also helps tip the scale in favor of this recipe. Hammond likes how the recipe is easy to follow and not so complicated as to make it inaccessible to inexperienced chefs. It also passed his “Does this dish make me hungry?” test. “Like a lot of good recipes, as I read it, I can taste the food being described: the flavors make sense when I imagine them together,” he says, adding that this recipe is not a radical departure from the Thai culinary tradition, but it is a solid presentation of a familiar set of flavors, with the process clearly delineated. The judges’ duty has ended here. It’s now you, readers, who will determine which of these five finalists will receive the cash prizes. The first prize of $599 and the second prize of $399 will go to the finalists who have received the highest and the second highest number of votes as of 11:59 p.m. CDT on July 18th, 2011, respectively. Voting is open now. You can vote by leaving a comment on this post including the number (#1, #2, #3, #4, or #5) in your comment. If you’d like to tell us your reason, please feel free to do so. Otherwise, a simple “I vote for #X” is enough. Anyone can vote. One finalist per vote. One vote per account. Finalists, of course, can vote for themselves. Please don’t vote by sending an email to me for all votes need to be cast in public on the site. Bill Daley – Daley is a food and feature writer for the Chicago Tribune. He covers chefs and food personalities as well as cooking techniques and trends. One of his fields of expertise is food and beverage pairing. Mike Sula – Sula is a James Beard-nominated food and restaurant critic for the Chicago Reader. A big fan of Thai cuisine and highly knowledgeable about the subject, Sula has written numerous articles about Thai food and Thai restaurants in the United States. David Hammond – Hammond writes the weekly Food Detective column in the Chicago Sun-Times and produces food-related segments for WBEZ (91.5FM), Chicago’s National Public Radio Station. He is also co-founder and co-moderator of LTHForum.com, the almost 10,000 member Chicago-based culinary chat site. None of the judges is affiliated with SheSimmers.com or its advertisers. I vote for Finalist # 3, Sonia. That dish looks scrumtrulescent. What a great use of quinoa. #1 recipe: Spicy Ginger Chicken-Cakes gets my vote! I vote for #3, Sonia’s dish. Yum. My vote goes to #3. Thanks, Leela! 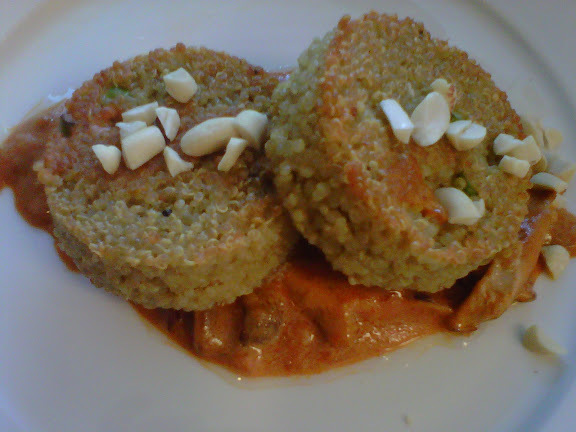 My vote is for the Quinoa cakes with red curry sauce! Good luck Sonia! Vote – #3 – Looks Delicious! I vote for Rachel Cooks Thai’s awesome recipe! Elegant! My vote goes to recipe #1 – the recipe looks and sounds delicious! And the photos are amazing – they make you want to make it! I made #5 and it is the best ever! Delicious and simple. My vote is for #5. I vote for #1 – My Merry Cooking! Those Spicy Ginger cakes get my tastebuds going! I vote #3 Sonia! Thai it up! #2 – great recipe, Rachel! #3! because it looks delish! #2 – My vote goes to Rachel’s sophisticated appetizer. It looks like restaurant quality dish…. I vote for Sonia #3, ALL DAY! I vote for #1, because it looks beautiful and delicious! Sonia, #3, takes the (quinoa) cake for me! #4 for me. Go Chris!! Recipe #1 of course–Merry’s recipe is the BEST! #1 Merry’s spicy Ginger chicken cakes are to dying for!!! I vote for Merry Graham’s recipe! I vote for #5! The recipe is simple enough for a novice chef like me, but looks like it was much more work than it was to impress dinner party guests. #3 – sonia – that dish looks very healthy and creative! I agree with the judges. 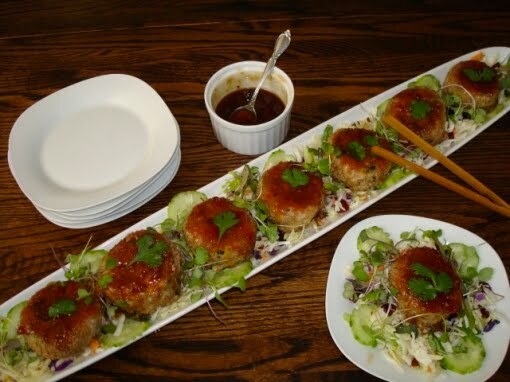 The Thai Chicken Cakes (Merry Grahms creation #1) is something people would actually cook. My vote is for her recipe. I strongly vote for #1, Merry’s fabulous recipe with it’s striking photo…there’s a reason she’s already in the number one spot! #5 all the way! Looks delicious!! The clear winner here is 5! Looks delicious! I vote for #1!! Looks delicious and I can’t wait to make it!! My vote is for #1, Merry’s Spicy Ginger Chicken Cakes – they look and sound amazing! My vote is for # 1 – I love cakes of any type and this are beautiful with a yummy sauce. my vote is for SONIA FINALSIT #3! #5 is my favorite. Can’t wait to try it. I vote for #1, sounds and looks delicious!! Definitely something I would make!! I vote for #5! I can’t wait to try this recipe! I vote for 5! Beautiful pictures! I vote for #5 – it was absolutley delicious. I loved the pictures and the instructions were quite clear. I vote for Rachel – #2. My vote goes to Rachel and dish number 2. Voting for #1–Would definitely try those cakes at home! Voting for #1 – Merry’s Spicy Chicken Cakes — looks yummy! I vote for #5. Jessica’s app. sounds and looks delicious! I vote for #1 by #1 Merry!! Looks yummy and beautiful!!! My vote is for #5: Jessica’s Thai Shrimp Bites. The instructions are well-written, the pictures are beautiful, and the shrimp bites look delicious! I vote for #3. It looks great! #5! I’m now craving shrimp. My vote is for the Quinoa cakes, #3! Finalist #5 from Inquiring Chef! I vote for #1. Merry’s chicken cakes look absolutely amazing! #3, Sonia! Looks delicious and very creative! Can’t wait to try #3. I love quinoa and have been looking for recipes to spice it up. #3 (Sonia at My Little Kitchen Laboratory) is number one! My vote is for recipe #1 Merry Graham’s dish is delicious! I vote for #2. It looks delicious! I vote for #3. Love the recipes on My Little Kitchen Lab. I vote #3 – Sonia! I vote for Merry’s #1! i vote for dish #2. it looks tasty! I vote for #2!! beautiful presentation! I vote for #3, it is awesome! Previous commenter: Can you confirm that you’re voting #3 or #2? You got the names and numbers mixed up. #2, Rachel’s appetizer looks amazing! #3 all the way! Can’t wait to try it, Sonia! I vote for the #1 recipe by Merry Graham. Recipe 3 sounds super tasty! I’m voting for #3. I vote for #2 – My mouth is watering as I type. Finalist #2! Creative and unique! Traditional flavors with a contemporary flair- wow! Administration: I assume you will delete the duplicates too ~ thanks! Sonia #3 gets my vote! x2 on David’s review. I really appreciate the unique application of traditional ingredients. Number 2 has my vote!!! #5 all the way. YUM! I vote for #3, Sonia. Can’t wait to try it! # 5 is by far the best! I vote #3 — Yum! Rock on, Sonia! # 3,yummy and professional too. My vote is for #3! Delish! a vote for #3, sonia! Casting my vote for #1–looks delicious. i vote for #3, quinoa cakes. I go for #5 … ! Thanks to the judges for the kind comments! I vote for #2. I vote for #5. Good luck Jessica! I agree with Mike Sula and vote for #2. Love how Rachel introduces the authentic Thai dish in a new way that everyone can connect with. I vote for #2. I’d like to try out this recipe at my next cookout. Rachel inspires me with her submission. #2 for me! I vote for 5! Love that site! I vote for #2 – I love the blend of something so flavorful and soft with the clean crispness of the cucumber! Number 5. Thailand we like this! I vote for #2! Yum!!! My vote goes to #2. I love cucumbers. Vote for #2. Nothing like the last minute – I vote for 5! We’re tallying up the votes now, weeding out obvious duplicates and unknown voters in the process. Looks like it’ll be a close race. The winners will be announced here after we have verified everything. Thank you. The votes which came in before the deadline have been recorded on this spreadsheet document. Finalist #2 and Finalist #3 are winners of the first and second prizes respectively. Congratulations. Emails will be sent out to you with instructions. Thank you all for participating. Those who didn’t make it to the finals and finalists who didn’t win this time, take heart. There’ll be more activities like this in the near future. Thanks so much ~ it was fun even though I didn’t win. I had so many others wanting to vote but just got frustrated with the profile box. Wish they could just post directly onto your Facebook wall. Thanks again! All of you presented very nice dishes. It was quite difficult for me to choose between no 1 and no 2 – and for me, the two of you are *my winners*. Thank you all, it was fun to follow this event, and A BIG THANK YOU TO LEELA for this great idea.